Ever since suffering from a seizure, a Providence artist has been seeing gears and designs that have led him to create truly emotional and inventive works of art. Christopher Thomas, who was born and raised in Rhode Island, works as an artist from his home studio in Providence, RI, now that he is retired from his old career as a physical therapist. Thomas graduated from the University of Rhode Island with a degree in Physical Therapy in 1991, and went on to work as a physical therapist for 14 years. He left his job when he had the opportunity to move to Europe during the early 2000’s. He spent years in Europe, and even became a citizen of the Netherlands, before making regular trips back home to care for his father, who fell sick in 2005. His first piece, he says, was of a clock that he designed for his father, who was unable to see it finished before he died. Thomas’ artwork is full of surprises, and beautifully depicts his struggle with chronic migraines and frequent seizures. In 2007, when Thomas suffered his major seizure, he fell, fractured his head, and woke up in the hospital. “I initially smelled the hospital then heard the beeping and knew immediately where I was,” Thomas said. Thomas claims that his appearance in the AS220 Gallery and URI Providence Campus Gallery last October and April marked a major turning point for him. After he appeared in the AS220 gallery he met Steven Pennell, the Coordinator of the URI Urban Arts and Culture program. Pennell said that he met Thomas after he was in search of a steampunk artist for an exhibit he was thinking of hosting. After the two got to talking, Pennell discovered the large volume of Thomas’ work and helped Thomas to realize that he needed to continue pursuing a career as an artist. After the two got to know each other, Thomas expressed his interest in returning to school and Pennell has since encouraged him to pursue his master’s in art therapy. Pennell said that as a teacher, he feels a responsibility to help people search for information about careers that are considered out of the box. With Pennell’s help Thomas is creating plans to use his gift as a platform for other migraine sufferers, or anyone with health issues, and is currently applying to schools with art therapy programs. The studio space in the basement of Thomas’ Providence apartment is filled with art pieces in progress, some half constructed, but everything seems to have its place. The room is filled with shelves and bins all sorted with parts from old appliances, collected from scrapping or donated by friends. Thomas uses these pieces to create sculptures and frames for paintings. There is a room in the back of the basement that he describes as his “picking room” filled with loose stuff that has yet to be sorted, but he keeps that mess separated. Ever since his seizure in 2007, Thomas sees, what he describes as, different gears and designs during his migraine attacks. He creates works of art out of these materials to illustrate what he sees and feels. He still suffers from seizure to this day, saying that he has both “hysterical and hypnotic seizures.” During his hypnotic seizures he may freeze, or black out, for hours without realizing that time has passed. In addition to this, Thomas has been struggling with his migraines since well before his major seizure. He has created a series of busts, sculptures of human heads, which illustrate how intense his migraines feel. He says that he finds it works as a better explanation than trying to verbally tell someone how he feels. These migraines often cause him to be up all night, sometimes for days. He tried to combat these migraines with “handfuls” of painkillers like Aleve and Tylenol, but it was killing his liver and kidneys. Thomas said he was able to detox from the painkillers and is now on a healthy diet. This struggle with migraines and his bouts of seizures is the inspiration for nearly all of his work, he said. A healthy and regulated diet has helped him to lessen the frequency of his seizures and his migraines are less intense. The URI Providence campus gallery recently held an exhibit featuring a large collection of his art work, showcasing his diverse style. Thomas has so many completed pieces that he was able to fill the halls of the URI Providence Campus with dozens of art pieces, ranging from decorative clocks and furniture constructed from recycled gears and various parts, to intricate sculptures, clothing and paintings. 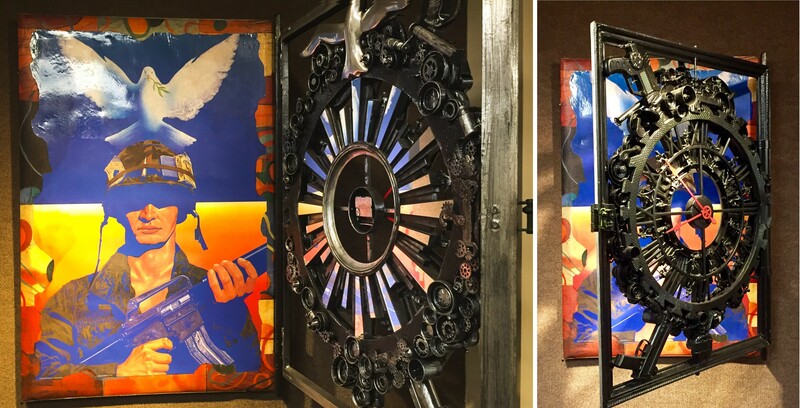 Some of the most impressive art pieces Thomas creates are paintings that are often covered by large clocks and frames made with moving parts so that the clocks can be opened up to reveal the beautiful paintings that are partially covered or hidden underneath. One such piece is “War and Peace,” a large painting of a solider that is outlined by a metal frame of doves, guns. These breathtaking works of art seem to capture the carefully constructed chaos of life, with all the small parts, some broken, coming together to make something beautiful. Featured image: Thomas’ “War and Peace” on display in the URI Providence Campus Gallery.